In 2012, the Newspaper Division of The E.W. Scripps Company, now part of Journal Media Group, and the Knight Digital Media Center at USC/Annenberg formed a unique “learning partnership” designed to accelerate the transformation of newsrooms in 13 markets from print-focused organizations to multi-platform news and information providers. The partnership, called the Four Platform Newsroom initiative, sought to create “digital leads” news organizations as the company launched an online subscription model. The goal: Produce significantly more high-quality journalism and audience engagement first for the web, smart phones and tablets and then turn to print at the end of the cycle. Digital tools and skills training would be a big part of the answer. 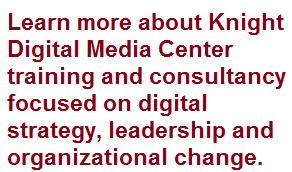 But KDMC knew from its extensive work helping editors change their newsrooms that cultural and organizational issues would have to be addressed as well. The transition from traditional, print-focused newsrooms to adaptive, consumer-focused news providers also would be challenging for newsrooms with little digital expertise. One question from the outset was how to generate creativity and ownership for digital transformation in harried, overworked newsrooms. The work would have a strong consumer/audience focus, and journalists would learn to conduct, analyze and act on market research. The staff, with research and with guidance from KDMC, would be entrusted with key decisions, while top editors would be asked to help facilitate rather than direct. The company would impose an overarching strategy and a process for implementing the initiative, but would not dictate specific organizational changes to the newsrooms. In addition to the expectation of innovation on digital platforms, newsrooms would be given a framework and repeated permission to reduce traditional coverage and print production activity as they saw fit. Two years plus into the initiative, the newsrooms report significant progress despite many challenges, including ongoing staff downsizing. They have increased activity on digital and social platforms by developing unique coverage of local topics of high interest to their communities. They have embraced new ways of interacting with audiences, including social media, real-time coverage and hosting community forums. They have begun to regularly produce video, data and other non-narrative story forms. At the same time, they have found ways to streamline print production, focusing more effort on digital platforms. 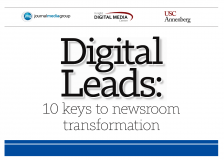 As the newspapers form a new, independent company, the newsrooms are well positioned to continue their digital transformation. Today, Mizell Stewart III, Managing Director/Content with Journal Media Group, reports that eight of the newsrooms – The Corpus Christi (TX) Caller-Times, the Kitsap (WA) Sun, the Knoxville (TN) News Sentinel, The (Memphis) Commercial Appeal, the Naples (FL) Daily News, the Redding (CA) Record Searchlight, the San Angelo (TX) Standard-Times and Treasure Coast (FL) Newspapers – are fully on a “digital leads” footing. Five others are on track to get there later this year, he said. Tellingly, the newsrooms that embraced the initiative and made it central to their work were quick to adapt, and the transformation continues today. “We have clearly moved beyond a print focus. Our competitive focus now is digital. 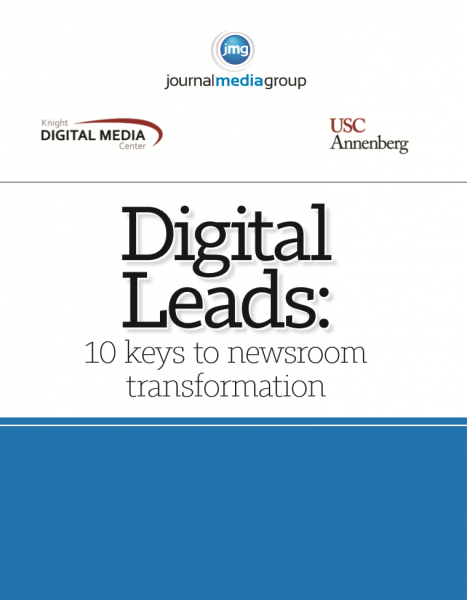 Each day we celebrate or lament how we performed digitally, then we put out a print edition. Print is not exactly an afterthought, but our process has become very mechanized,” said Jack McElroy, editor of the Knoxville News Sentinel and Knoxnews.com in Tennessee. The transition is far from complete and sustaining change will be an important challenge in 2015. But the initiative so far has produced significant learning about effective ways to produce meaningful culture change and elevate digital news and engagement in print-oriented newsrooms. In this report, we are sharing what we have learned.